This article is about the Arbiter in Halo Wars. For other articles including "Arbiter", see Arbiter (disambiguation). High Prophet of Regret: "Do you enjoy the slaughter?" Ripa 'Moramee: "I feel the joy of doing what I was born to. I have no regrets… save that I will not die fighting." Ripa 'Moramee was a Sangheili warlord and military commander who served as the Arbiter of the Covenant during the beginning of the Human-Covenant War. 'Moramee was ruthless and unrelenting, concerned more with victory and glory over honor. Though known for his intense rage and savagery, 'Moramee was an extremely effective commander and a highly talented strategist. Serving the Covenant's Ministry of Preservation with glory during the 23rd Age of Doubt, 'Moramee rose through the Covenant's ranks after subduing many civil conflicts within the empire, most notably quelling the Sixteenth Unggoy Disobedience and Krith's heretical reign. After being captured and imprisoned for leading a failed coup d'état against his kaidon on his homeworld of Malurok, 'Moramee was given the title of Arbiter by the Hierarchs, mainly at the urging of the High Prophet of Regret who sought to use 'Moramee's ruthlessness against the emerging human threat. In his new role, he was given command of the Fleet of Glorious Interdiction and led the Covenant's renewed campaign on Harvest, excavating a Forerunner artifact on the planet's surface. Towards the end of the campaign in February 2531, he assisted the Prophet of Regret in an attempt to reactivate a dormant Forerunner fleet on a Forerunner shield world. This led to a series of violent engagements against forces led by Captain James Cutter of UNSC Spirit of Fire. Ultimately 'Moramee was killed by Sergeant John Forge in the shield world near the end of the battle. Ripa 'Moramee was born on June 2, 2478 in his familial state of Moram, located in the craggy atolls of the Sangheili fortress world of Malurok. During the 23rd Age of Doubt, 'Moramee enlisted with the Covenant's military, serving the Ministry of Preservation as a warlord thrall to subdue internal uprisings within the empire. Early in his military career, 'Moramee rose in renown due to his success in several ordained campaigns, quelling various rebellions. His quick rise through the Covenant's ranks began during the Sixteenth Unggoy Disobedience, when he led a Covenant strike force to quell the dissenting Unggoy in a matter of days. 'Moramee later ended the heretical reign of the Kig-Yar pirate prince Krith, who rebelled against the Covenant on Malurok. The campaign against Krith reduced 'Moramee's legion to a handful of hardened killers, while also cementing his reputation for ruthlessness. After butchering the notorious pirate prince and his allies, 'Moramee personally retrieved the modified Type-27 beam rifle known as "Krith's Left Hand" from the Kig-Yar's personal vaults. 'Moramee would continue to hone his skills in war in dozens of compliance campaigns at the fringes of Covenant space, glassing worlds to prove his devotion to the Great Journey. However, 'Moramee's ambition grew too great, leading him to attempt a coup d'état against his kaidon in Moram. Having overestimated both his leadership ability and the strength of his own loyal forces, 'Moramee was finally defeated in battle when his coup failed and he was captured by the kaidon's forces. After being brought before his kaidon and a Covenant court, 'Moramee was found guilty for not only rebelling against his kaidon, but for failing in the process—an even greater sin. For his crimes, 'Moramee was sentenced to a cycle in the Weeping Shadows of Sorrow, a super-maximum security penitentiary, followed by condemnation to a "living death". 'Moramee was threatened by many of his fellow inmates for the dishonor he had brought upon his clan, eventually culminating with him inciting a large-scale prison riot a short time later. Using the resulting chaos to his advantage, 'Moramee attempted to escape, though he was soon captured, heavily beaten, and placed in solitary confinement within a plasma grid. 'Moramee's time in prison was not kind to his body physically and, while his incarceration did not break his spirit, he was left feeling purposeless. "Your fate is already decided. Your name, it is gone, expunged from the records of this facility. Rise up, I name you Arbiter." As the Human-Covenant War began in February 2525, the newly elected Hierarchs sought out a savage and cunning commander to name Arbiter to lead Covenant forces against the new human threat, as the empire massacred humanity's Outer Colonies. The High Prophet of Regret had heard of 'Moramee's audacious failure on Malurok and recognized the Sangheili warlord's ruthlessness. Seeking an agent of his own to name Arbiter to advance his personal plans, the Prophet of Regret visited 'Moramee in his cell at the Weeping Shadows of Sorrow. After ensuring that 'Moramee was still devout to the Great Journey and loyal to the Covenant, Regret named him Arbiter and pardoned him of his crimes. As the seventeenth Arbiter in the Line of Immaculate Succession, 'Moramee became an agent of the Hierarchs, now operating under the Ministry of Resolution. Regret's decision led to concerned mumbling among the Prophets' Honor Guard, who had no prior knowledge of this plan. 'Moramee was considered a radical choice as Arbiter; the appointment displeased many within the Covenant, with 'Moramee's methods and strategies coming under scrutiny. 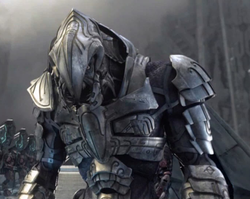 The creation of a new Arbiter caused a split in the Covenant: an ever-growing faction of Sangheili, who were opposed to the new Hierarchs, seized control of several Forerunner relics, including remnants of a massive Forerunner space installation that supposedly contained a "key" of some sort capable of activating Forerunner technology. The Arbiter was sent by the Hierarchs to end this rebellion, resulting in a vicious battle that raged for days which ended with the destruction of many heretics. The rebellion was silenced, but the mysterious key, however, was never found. Regret would later included 'Moramee in his plans to activate a Forerunner fleet of Sojourner-class dreadnoughts found within the recently discovered Shield World 0459—known as the Etran Harborage. Regret intended to use the fleet to quickly wipe out humanity, though the Covenant lacked the technology to activate the warships. Additionally, the parasitic Flood maintained a presence within the shield world, complicating Covenant investigations. "I care not for your little life! Open the relic!" Upon the return of Tartarus from the human agriculture world of Harvest, Regret formalized the Sangheili-led Fleet of Glorious Interdiction to recapture the planet, electing 'Moramee as its commander. Regret personally tasked 'Moramee with securing Harvest to search for Forerunner artifacts, believing that the world may contain a key that could activate the Forerunner dreadnoughts. When the Fleet of Glorious Interdiction arrived at Harvest in 2526, the fleet became entangled in a five-year long campaign against Admiral Preston Cole's Third Fleet. The United Nations Space Command was aware of his presence, but was unable to gather more than cursory intelligence used to construct a target profile on him. Despite having command of the Covenant forces during the campaign, 'Moramee was not always present on Harvest. He also led Covenant forces in removing the Flood presence in the interior of the Etran Harborage. In around February 2531, while 'Moramee and Regret were visiting the recently cleansed interior of the shield world, forces of the Fleet of Glorious Interdiction had located a Forerunner "relic" beneath Harvest's surface, in the planet's northern polar region. When 'Moramee reported the discovery of the temple to Regret, the Hierarch chastised the Arbiter for not being personally present for the relic's discovery and sent him back to Harvest to search for the alleged key. Upon returning to Harvest, the Arbiter met with Field Master Re'gish Wamik, who was leading the Covenant forces in excavating the relic. During the relic's excavation, 'Moramee sent in squads of Unggoy to ensure the interior was safe, fearing a possible Flood occupation. The Unggoy would live if the path was clear, but if they demonstrated any fear or if any trouble was detected, 'Moramee would detonate plasma bombs that were attached to their methane tanks to clear out any possible threat. Despite concerns by Field Master Wamik that the Flood may be present in the installation, 'Moramee pressed on due to the impatience and pressure of the Hierarchs, and ordered for the relic to be opened. However, with UNSC forces closing in, the Prophet of Regret ordered 'Moramee to destroy the installation and return to the Covenant with the information he had gathered—coordinates pointing to a second system. The Arbiter was reluctant to destroy the Forerunner relic, though complied nonetheless upon the continued insistence of the Hierarch. However, the attempt to destroy the relic failed when the demolition teams were thwarted by UNSC ground forces deployed from the orbiting UNSC Spirit of Fire. "The Ancients have granted us the power to doom your race. Let the deconstruction of our great gifts begin! The majesty of our new fleet will be unparalleled!" The information from the Forerunner relic on Harvest led the Fleet of Glorious Interdiction to the human Outer Colony of Arcadia, the location of a Forerunner structure. As the Battle for Arcadia began, some Covenant forces attacked Arcadian population centers, while others scoured the planet's dense jungles where the collection of Forerunner ruins was discovered. After they found the ruins, the Covenant deployed a massive dome-shaped energy shield on the planet's surface to prevent the UNSC forces from reaching the structures. However, they ultimately failed to prevent the UNSC from assaulting the Forerunner site. Inside Etran Harborage, 'Moramee and the Prophet of Regret both continued to attempt to activate the dormant fleet of Forerunner dreadnoughts at the Apex Site within the shield world. During this operation, 'Moramee was concerned about why he was not fulfilling his task of destroying humanity, when he should command all their forces for a frontal assault; Regret stated that they need the Forerunner ships to increase the size of their fleets, so that the Covenant would not have to dedicate all their forces for the war effort and thus leave themselves defenseless. After attempts to interface with the Forerunner technology failed, 'Moramee was sent on a mission to capture Professor Ellen Anders at the ongoing Battle for Arcadia by the Prophet of Regret, as he believed she would have ability and knowledge of how to interface with Forerunner structures that the Covenant did not. Following Regret's commands, 'Moramee returned to Arcadia and ambushed Anders while she was documenting the remains of a Type-29 Scarab. While the Arbiter attempted to capture Anders, Marine Sergeant John Forge intervened. The Arbiter dropped Anders and charged at Forge. Forge attempted to kill the Sangheili with his M6C magnum, but it had little effect against the Arbiter's armor. 'Moramee attacked the Marine with his energy swords but before he could kill him, Anders surrendered herself to save Forge's life. Satisfied, the Arbiter grabbed Anders and escaped in a Spirit dropship to an awaiting ship seconds before Spartan Red Team arrived. Forge and Red Team returned to Spirit of Fire and pursued 'Moramee's vessel through slipstream space. 'Moramee reached the shield world first and imprisoned her in a stasis field at the Apex. Shortly after, a Spirit dropship delivered the Prophet of Regret to the Apex. While the two commented on Anders' frail appearance, a Sangheili Zealot warned the Arbiter of Spirit of Fire's arrival. Angered, 'Moramee punched the Zealot several feet backwards and ordered Regret's Honor Guard to return him to High Charity, arranging for the Jiralhanae chieftain "Thrallslayer" to accompany Regret to rob the Jiralhanae of any glory in the oncoming battle. Then, he ordered for his fleet to intercept the human ship and destroy it. Although the CPV-class heavy destroyer Proclamation's Tithe intercepted and attacked Spirit of Fire, the human ship was able to escape. Some time later, the Arbiter returned to Anders and released her from the stasis field. 'Moramee forced her to interface with the Forerunner controls and begin activating the Forerunner fleet. While the Arbiter began to charismatically preach about the activation of the dreadnoughts to his fellow Sangheili, Anders managed to escape from 'Moramee through the Apex's translocation system and alerted the UNSC of the Covenant's intentions. "My face will be the last thing your pathetic eyes ever see." Sergeant Forge and Red Team were quickly dispatched to Apex Site with orders to destroy the shield world using Spirit of Fire's removed Shaw-Fujikawa Translight Engine by causing its core to overheat, thereby causing the shield world's internal sun to go supernova. As several Stealth Sangheili assaulted the Apex, 'Moramee used his active camouflage unit to ambush and kill the Marine lieutenant in charge of opening an elevator which led into the sun. While Red Team engaged in combat with the Stealth Sangheili, Forge took on the Arbiter. As the fight between the two began, Forge managed to disarm his opponent despite the physical disparity between himself and the Arbiter, relying on combat skill rather than raw strength. However, 'Moramee quickly fought off Forge and incapacitated him with a punch to the stomach. The Arbiter then proceeded to taunt and injure him by throwing him around the Apex. Feigning defeat, Forge challenged 'Moramee to look him in the eye before killing him. The Arbiter complied and lifted the sergeant by his neck while unwittingly bringing his own neck within the reach of his opponent. Forge drove his combat knife—"Lucy"—into his adversary's neck, then used the incapacitated Arbiter's dropped energy sword to stab him through the chest, killing 'Moramee. Ripa 'Moramee's corpse was rolled off the platform by Alice-130 of Red Team shortly before the translight engine overheated and destroyed the shield world. The loss of 'Moramee's armor was mourned by the Covenant, as it could not be stored within the Mausoleum of the Arbiter on High Charity. Some theorize that had 'Moramee survived the battle at Etran Harborage, Atriox could have convinced him to join the Banished. "Like the rest of your race, weak and undisciplined." Ripa 'Moramee was a ruthless and unrelenting Sangheili commander, known for his nearly insatiable bloodlust and ambition. Unusually violent and quick to anger, 'Moramee's temper was regarded as something of legend. In mad fits of rage, he could summon great strength and speed that was almost unmatched. However, 'Moramee was noted for not discriminating who he directed his rage at. There were several accounts of 'Moramee being the sole survivor in skirmishes, having slain ally and foe alike while enraged. He was known to kill subordinates serving under him for failing their tasks or even bringing ill news. While at the Etran Harborage, he struck a Zealot—throwing him to the ground—upon being informed that UNSC Spirit of Fire had followed them to the shield world. When his orders to open the Forerunner relic on Harvest were questioned by Field Master Re'gish Wamik, he verbally lashed out at his subordinate, telling him "I care not for your little life!" Throughout his life, 'Moramee was said to have never found peace, living without a moment of rage. Driven to control and dominate, 'Moramee was highly ambitious. As the Arbiter, he came to enjoy the nearly unchecked power and authority he wielded as part of his title. For this, he was considered to be a radical choice as Arbiter. 'Moramee was greatly concerned with ensuring victory on the battlefield, no matter the cost. He held no ill-will about sending his troops to their deaths if he believed such actions would bring him victory. His greatest weakness was that his audacity sometimes blinded his ability to choose his battles more wisely, as was the case when 'Moramee attempted to usurp his kaidon in Moram. He had overestimated his leadership ability and strength of arms, leading to 'Moramee finally seeing defeat on the battlefield. While ultimately a skilled strategist, 'Moramee was unable to lead through loyalty or charisma. Instead, he often inspired a combination of fear and awe to those under his command. 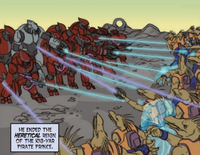 Unlike most Sangheili, 'Moramee had little concern for honor, unbound by traditional notions of loyalty. His appointment as Arbiter was controversial within the Covenant Empire, as his ruthlessness and strategies came under heavy criticism and scrutiny. Using his authority as Arbiter, he would often bind disgraced Sangheili with iron-clad oaths to his unquestioning service as vassals in exchange for a return to the rolls of honor. As noted by Volume III of The Punished Deeds, 'Moramee did not fear death, though even he was afraid of the Flood. Had 'Moramee survived the battle for the Etran Harborage, some theorized that Atriox may have been able to have convinced the Arbiter to join the Banished, as Atriox was impressed with 'Moramee's fearsome reputation and unconventional personality. 'Moramee considered his life hard and difficult, his own path always murky and dark. Nonetheless, 'Moramee was still a devout follower of the Great Journey, having glassed worlds to prove his piety and devotion. Before his first encounter with the High Prophet of Regret, 'Moramee felt the Great Journey did not include one such as himself stating he would "be left here to rot like garbage", having failed to rebel against his own kaidon. Upon his first encounter with Regret, he thought how easily he could end the life of the Prophet who disturbed his penance. It was not until he was made an Arbiter that he proved himself to be fanatically loyal to the Hierarchs, especially Regret, and carried out his task to eradicate humanity with fervent zeal and efficiency as a means to secure his place in the Great Journey. However, he remained impetuous before the Hierarchs, once activating his energy swords in the presence of Regret, unnerving the High Prophet's Honor Guard, for wielding a weapon before a Hierarch is traditionally punishable by death. Having honed his skill at arms in dozens of compliance campaigns at the fringes of Covenant space, Ripa 'Moramee was a skilled warrior and a very talented strategist, wielding two Type-1 energy swords with devastating skill. When enraged, 'Moramee was capable of summoning remarkable strength and speed, proving unmatched and devastating on the battlefield. Considered a great force to be reckoned with, 'Moramee was an extremely effective, if brutal, commander on the battlefield, though he inspired loyalty in his troops through fear rather than charisma. Although a commander, he preferred to fight in single combat. Martially savage in battle, 'Moramee often maintained a ready swordsman posture. While serving the Covenant's Ministry of Preservation, Ripa 'Moramee was adorned in a standard, silver-colored Sangheili combat harness. After his appointment to Arbiter, 'Moramee was given custom-fitted body armor, featuring an elaborate sallet. Although the armor had been fitted properly to his body, 'Moramee considered it to be uncomfortable, finding the armor to be sharp and unforgiving. His armor was destroyed with the destruction of the Etran Harborage, a loss mourned by the Covenant. 'Moramee typically wielded two Type-1 energy swords, which featured customized hilt guards. He also preferred to arm himself with either a Type-25 plasma rifle or a Type-51 carbine. As Arbiter, 'Moramee was given unrestricted access to experimental stasis weapons. Check out our collection of quotes related to Ripa 'Moramee in its quotes page. "Our Arbiter is a mean guy. He's Darth Vader times ten." Ripa 'Moramee was created to serve as the primary antagonist of Halo Wars and a leader in the game's multiplayer, debuting in March 2009. 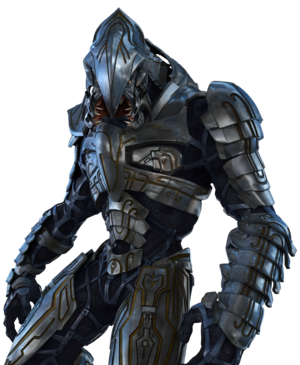 He is the second Arbiter to appear as a character in the universe, with the first being Thel 'Vadam. Lead designer David Pottinger described 'Moramee as a completely different character than 'Vadam, asserting his antagonistic behavior and comparing him to a worse Darth Vader, the characterization coming from the desire to make the Covenant more menacing in order to provide a traditional good guy-bad guy conflict in the story. The Arbiter's backstory was provided with Halo Wars: Genesis, a graphic novel released alongside Halo Wars. His lines were performed by Canadian voice actor David Sobolov, while the character was digitally animated for cutscenes by the California-based animation studio Blur Studio. Early renders of 'Moramee depict his Arbiter armor with various additions to the Halo 3 Arbiter armor, including a mouth guard and spiked wrist guards. These were removed in later versions, probably because they were radically different from the standard Arbiter armor. An Easter egg in the hint text from Halo Wars claims "Few people know that the Arbiter's given birth name is Shirley," referring to his line from the first level in response the Regret's command to destroy the relic on Harvest: "Surely you jest!" This refers to a running gag in the Naked Gun series which also appears in the movie Airplane! : "Surely you can't be serious!?" "I am serious, and don't call me Shirley!" On June 28, 2017, Ripa 'Moramee was added as a leader for Halo Wars 2 multiplayer as downloadable content, released with new abilities and units. Concept art of Ripa 'Moramee in Halo Wars. More Halo Wars concept art. Early concept art of Ripa 'Moramee for Halo Wars. Ripa 'Moramee in Halo Wars. Face-on view of Arbiter Ripa 'Moramee in Halo Wars. Arbiter armor study for Ripa 'Moramee, based on early concept art. A side profile of Ripa 'Moramee. A front view of Ripa 'Moramee. Front of Arbiter's Leader Card. Back of Arbiter's Leader Card. The Arbiter in-game seen dual wielding two energy swords, in Rage mode. Ripa 'Moramee facing John Forge. Ripa 'Moramee attacking an Insurrectionist Base turret on Harvest. The Arbiter lunging towards a T-26 Wraith while in Rage mode. An action figure of Ripa Moramee released by McFarlane Toys. Another figure of Ripa 'Moramee by Mcfarlane Toys. Blitz card of 'Moramee in Halo Wars 2. Ripa 'Moramee in Halo Wars 2. Ripa 'Moramee near a Banished Outpost. Ripa 'Moramee using his Rage ability against Jiralhanae and Unggoy. The Arbiter uses his Rage to kill a Huragok. A fully upgraded Arbiter attacking a Banished Outpost. ↑ 7.0 7.1 7.2 7.3 7.4 7.5 7.6 7.7 7.8 7.9 Halo Wars 2, Phoenix Log – "The Arbiter"
↑ 10.0 10.1 10.2 Halo Wars, campaign level, "Relic Approach"
↑ 11.0 11.1 Halo Wars, campaign level, "Alpha Base"
↑ Halo Wars, campaign level, "Relic Interior"
↑ 13.0 13.1 Halo Wars, campaign level, "Beachhead"
↑ 20.0 20.1 20.2 20.3 Halo Wars, campaign level, "Escape"
↑ 22.0 22.1 22.2 Halo Wars 2, Phoenix Log – "Elite Enforcers"
↑ 24.0 24.1 IGN Video: Universe Expanded: Halo Wars / Act 2 - Evolution"